Well, Saturday I decided to run out to a couple of estate sales and see if they would yield any must have treasures. The first one was so awful. It was in a terrible neighborhood in downtown Louisville and I wasn't even going to go in at first. However, after driving almost 20 minutes to get to it I did go on in, looked and then promptly left. Ick! Then on to the second one which really wasn't an estate sale after all. It was a driveway sale. 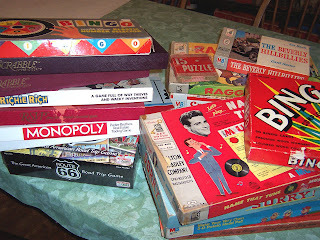 BUT, she had some good stuff and when I asked about board games she let me in to her downstairs apartment and let me dig through some boxes....oh what do I get myself into? I came out unscathed fortunately but I do have to wonder about myself sometimes! Then she let me go dig in her garage through the two shelves of games out there! Apparently she had been a big time ebayer but was tired of it! I then went to two little outdoor flea markets and one thrift store while I was in the same area. Found something everywhere, of course! Found lots of goodies!!!! One of the best finds was an unopened Rt. 66 game with the best cards in it! They look like miniature old fashioned postcards! I can't wait to use the AZ ones in our Rt. 66 trip scrapbook! And I found these stacks of paper words that spell out GREAT HUSBAND! How funny is that? Great stuff for my etsy shop which I then spent the rest of the day attempting to dissect and organize until I completely collapsed! 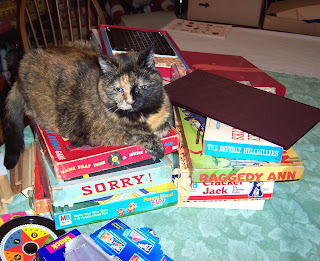 You see my little helper, not only did she fully inspect the piles of games, she also went to sleep on them! You're fired little Ms. Kitty! So, out of necessity, I have spent the better part of today trying to actually list items in my etsy shop! You are one lucky treasure hunter! Your finds are always so fantastic!